Jeep recently revealed the new-generation Wrangler which brand claims is the most capable and techier yet. But what Jeep fans are eagerly waiting as well is the Wrangler-based pickup truck. The truck version was expected alongside the new Wrangler and but Jeep delayed model’s debut about a year from now. We know now that production of this model will begin in Nov 2018 and production will take place at the Toledo Assembly Complex. The pickup truck will likely be marketed as the 2019 Jeep Scrambler. The new Jeep’s truck will be based on the redesigned Wrangler Unlimited and will share similar styling, powertrains, and technology. The truck will likely use two of three Wrangler’s engines and will offer differed top options while will come with four-door cab only. 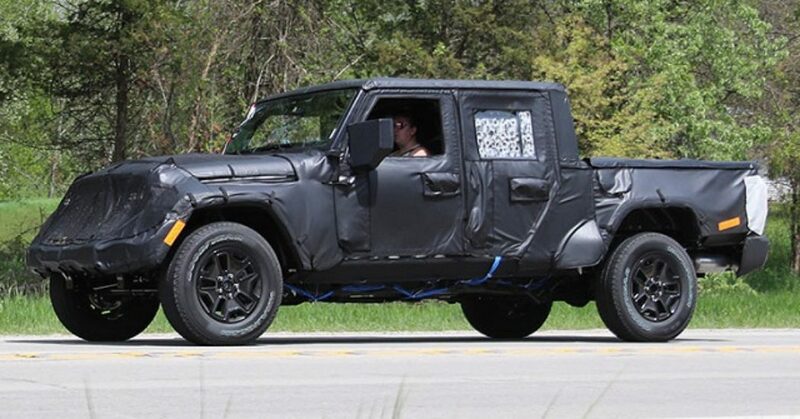 The prototype of the 2019 Jeep Scrambler was spotted on several occasions and what we can tell for sure the model will actually be the Wrangler Unlimited with the cargo bed. The model will have pronounced front bumper and the more aerodynamically shaped seven-piece grille as the new Wrangler. The LED lights will also be available on this model while it will retain similar profile and signature elements as the current Wrangler model. The truck will, of course, get the cargo bed and in order to accommodate it, the model will be about three feet longer than the Wrangler SUV. Jeep will also use aluminum to save some weight and this material will be used for the hood, fenders, doors, hinges and windshield frame. What is also interesting, the latest sources promise at least three top options. The truck will get the removable soft top option, and the three-piece hardtop will be available in black and body color. Inside, the pickup truck will exhibit the similar design as the new Wrangler. The model will come with the four-door cabin only and will offer the same tech and safety equipment as the redesigned SUV. The cabin will offer a number of clever storage solutions and the latest Uconnect infotainment system. The size of displays will depend on the trim level and like the Wrangler, the Scrambler will likely offer 5.0-, 7.0- and 8.4-inch options. Bellow the center screen will be climate and audio controls. With the latest infotainment technology, the Scrambler truck will also get a number of passive and active safety systems like the new Wrangler. The model will include systems like electronic roll mitigation, blind-spot detection, rear-cross path tech, etc. As for the engine options, the 2019 Jeep Scrambler will again borrow from the Wrangler SUV. However, some sources suggest that Wrangler’s new 2.0-liter turbo-4 engine won’t be available in the truck version. This engine works with eTorque mild hybrid system and provides 270 hp and torque of 295 lb-ft in the new Wrangler. The Scrambler will, however, exploit a familiar 3.6-liter V-6 engine. The engine produces 285 hp and torque of 260 pound-feet. Jeep will pair this engine with the six-speed automatic and new 8-speed auto gearbox. The new pickup will also get the diesel option. A 3.0-liter turbodiesel V-6 unit will provide 260 hp and torque of 442 lb-ft. Leaked details also suggest the towing limit at 6500 lbs. The payload max should be 1400 lbs. A long-awaited 2019 Jeep Scrambler should enter the production in next November. The price should be around $35, 000.